With all of the special events and distinguished guests gracing the Johnson hallways in March, I’ve fallen behind in sharing our everyday excitement with you. Between the author visits and Cat in the Hat parties, we’ve had a wonderful month of learning, growing, and falling love with reading. Library circulation broke 14,000 books this month, and the number of students that have reached their Book It goal soared over 350 (382 as of this morning, to be exact!). Take a look at some of the cool things we’ve been doing this month! 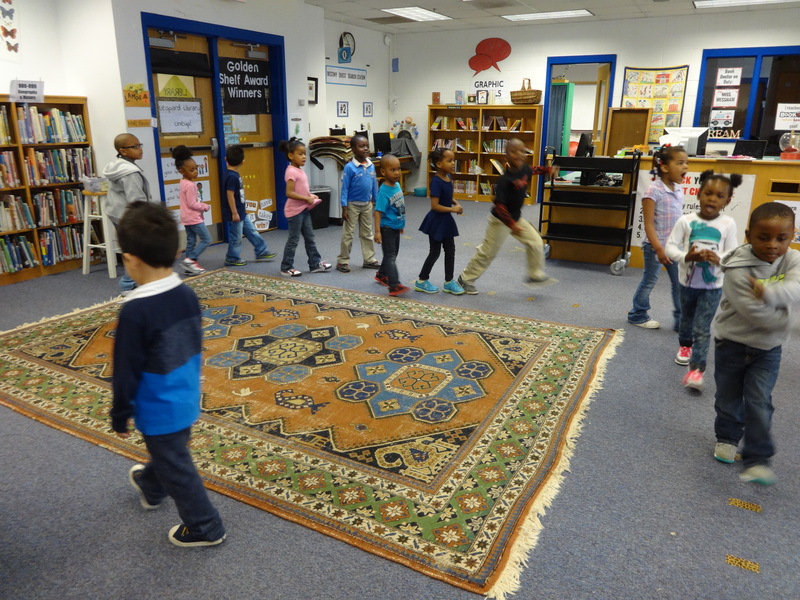 Pre-school students sing, march, dance, craft, and play in the library. Learning through song and play is the way we spend our mornings around here! Look closer to see some dedicated fourth grade helpers lending a hand to the lucky students in the Early Childhood Special Education program. 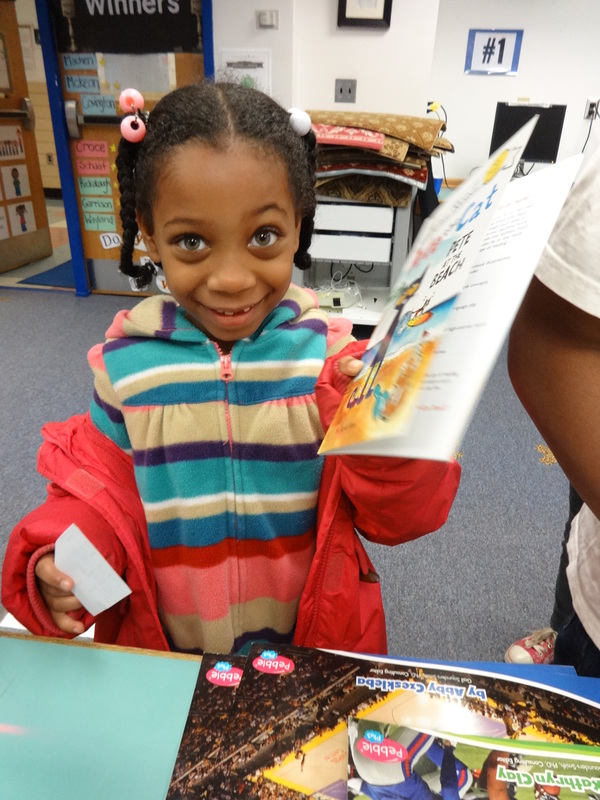 Did you know that March was the last month of Johnson’s Book It program for the 2014-2015 school year? To celebrate, we have been pulling Book It raffle winners from our pool of participating students every Thursday morning. Our books generously donated by contributors through DonorsChoose.org have been a HUGE hit, and it is impossible to capture the excitement and joy through just photos (although I dare you not to smile when you see some of those faces!!). Students have the opportunity to turn in completed March Book It logs through next Wednesday afternoon. Thursday morning, we will be calling our GRAND PRIZE Book It winners. Students that have completed the challenge each month and encouraged classmates to do their best have an extra chance to win! Students can also be nominated or honored by their teachers for excellence in reading and Book It participation throughout the year. Check back next week to see our winners, and their prizes! At this point in the year, many students feel overwhelmed or overworked in their classes. 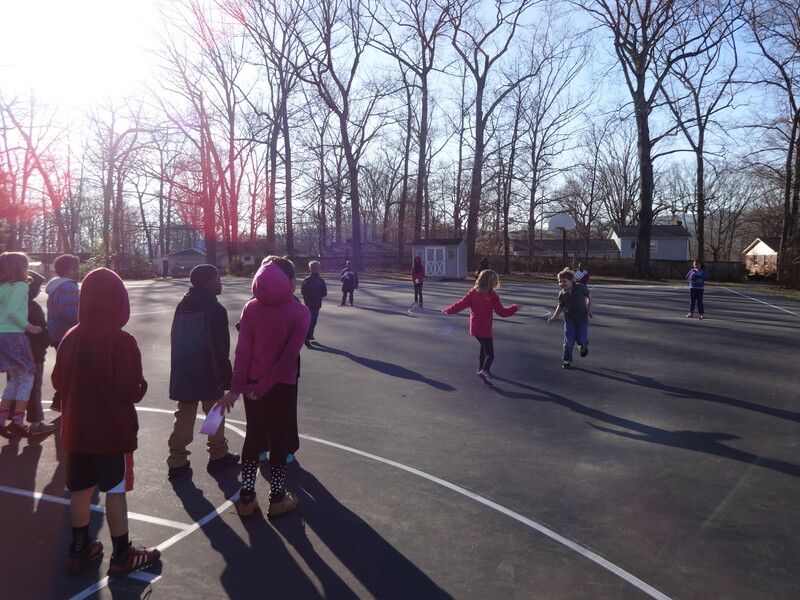 To get some smiles, I have a game going with second, third, and fourth grade students – creative and wacky warmups to take their minds off of testing and report cards when they walk in the door. 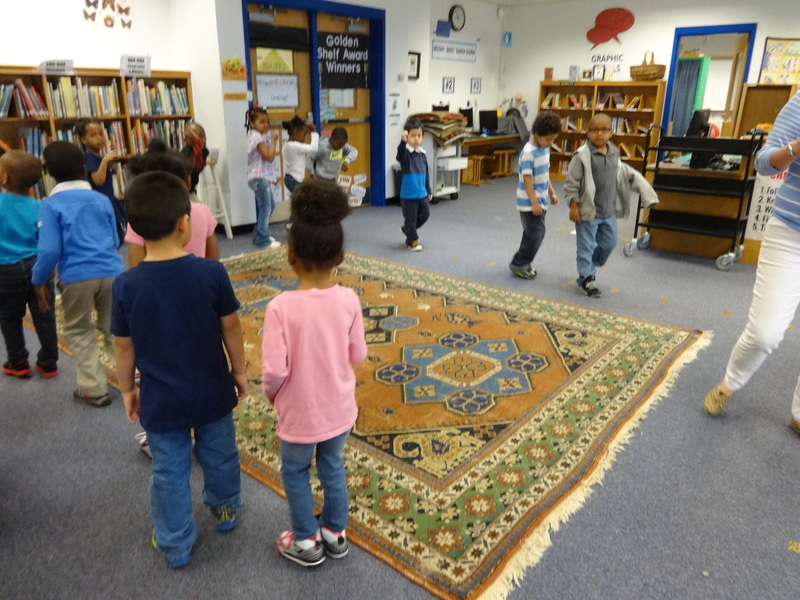 Last week’s warm up, pictured above, challenged them to think like a four-legged friend! 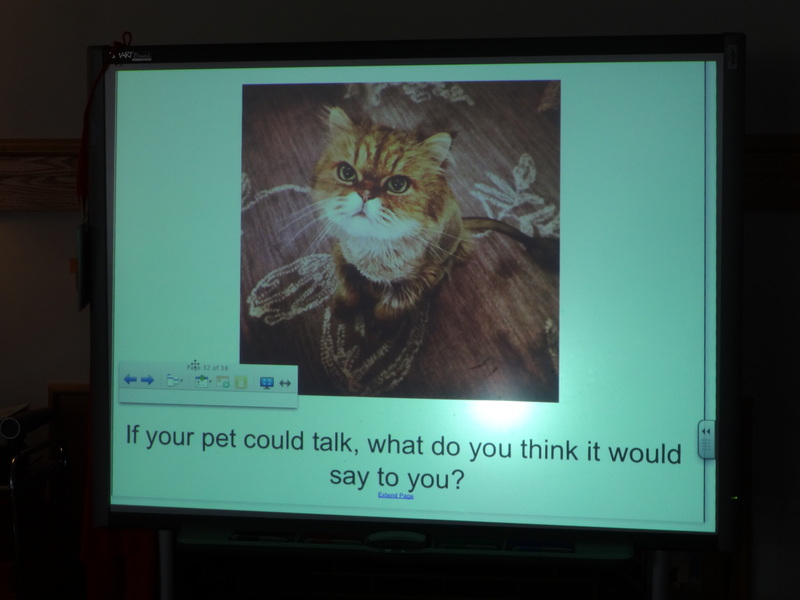 Students without pets at home got to “borrow” mine, a cat named Mo. 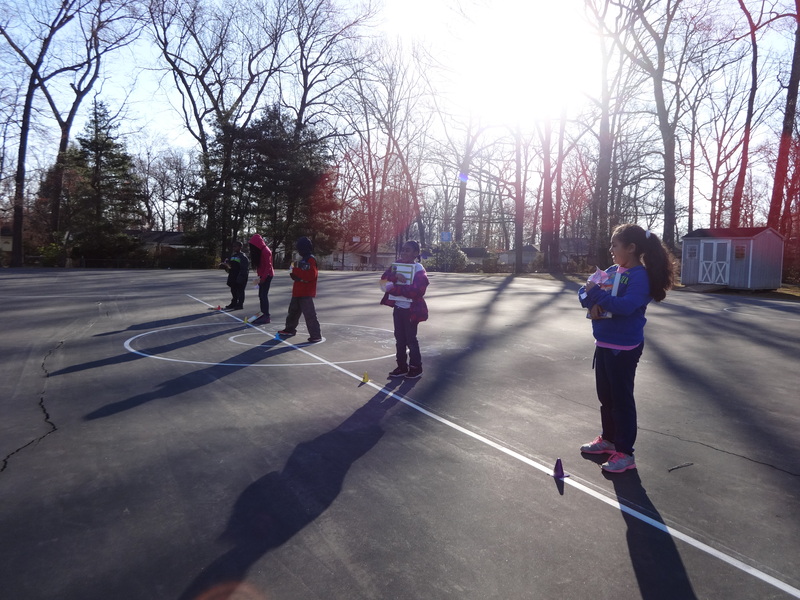 Our warm-ups get wackier and wackier as the year goes on, challenging students to step outside the box to think (and write) in a creative and fun way before getting started with our lesson for the day. 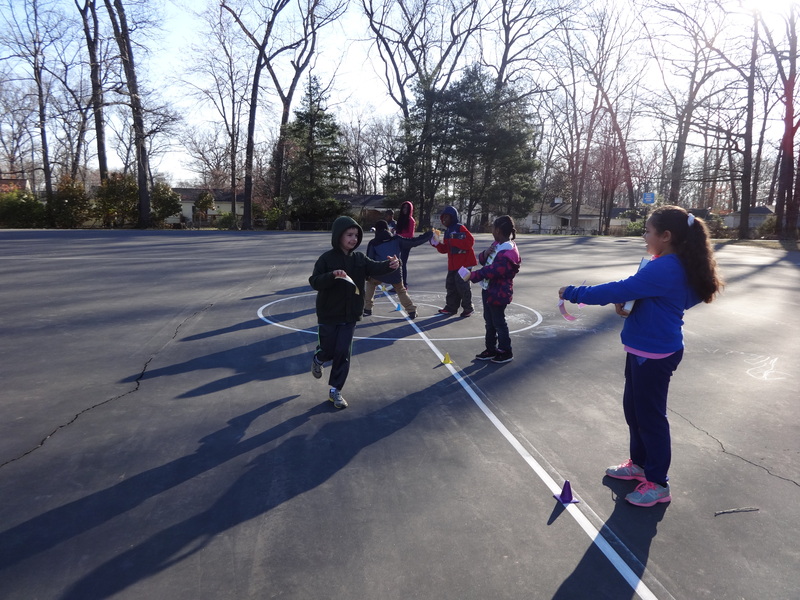 Third graders spent the week RUNNING to show off their reference skills! Two teams raced to match research questions to the corresponding reference tool. For example, which reference tool would you use to answer this question: Which states border Virginia? If you answered the atlas, then you’re right! 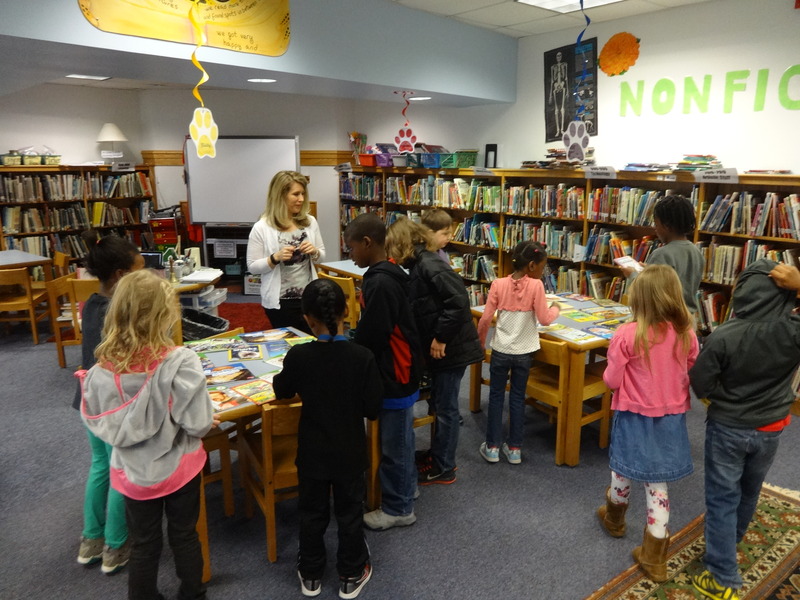 A second grade class searches for the perfect books to check out with Mrs. Covington during their checkout time. In the last two pictures, two role model students show off some of the changes with our new computer system. Our old checkout computer was a touch screen, but our new computer offers faster and more reliable checkout for students. 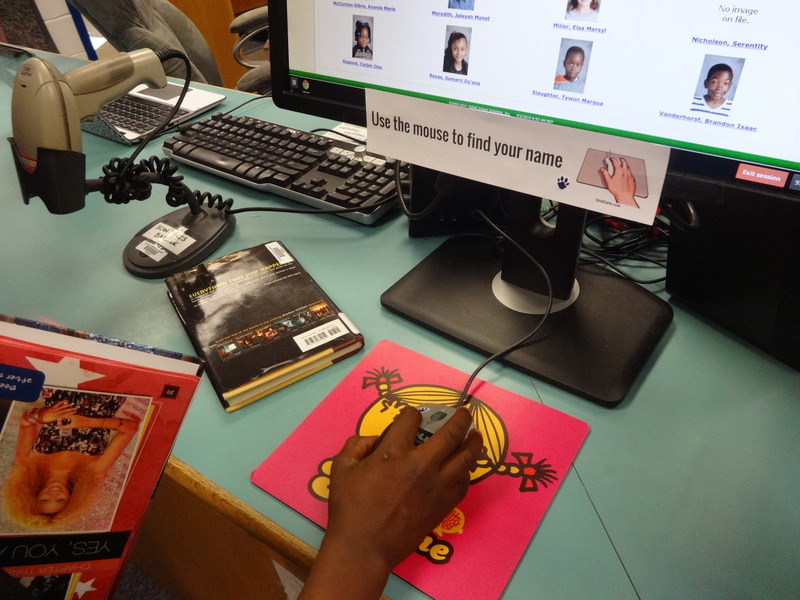 It has been a challenge for some students to get used to using a mouse – above, Thimson and Brandon show the steps for a successful checkout, including clicking the pawprint on the mouse and listening for the happy noise after you scan your book. Thanks for the help, guys! 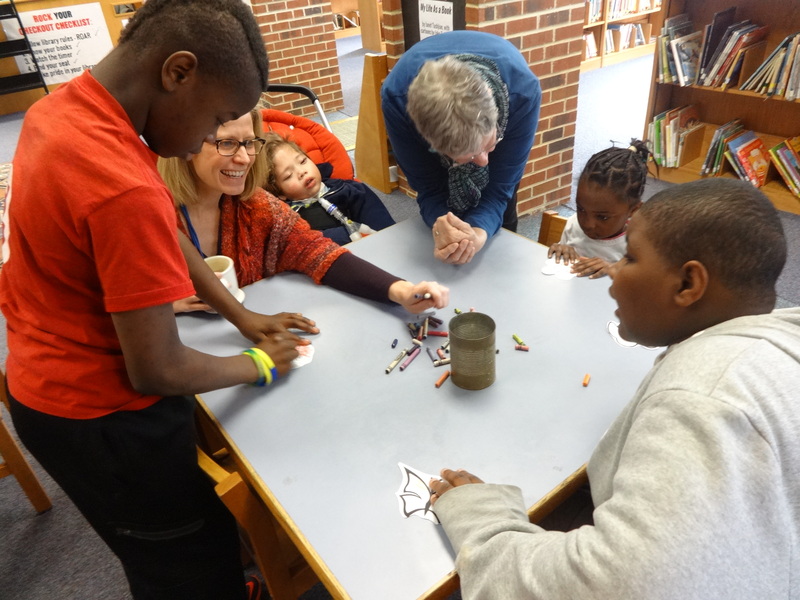 Did you know that classes visit the library TWICE each week? Once for a 30 minute information literacy lesson, and again on Thursday for a 15 minute check out time. This time is dedicated to finding the best books for each student. Teachers accompany their classes to help students find books that are challenging, interesting, and on an appropriate reading level. 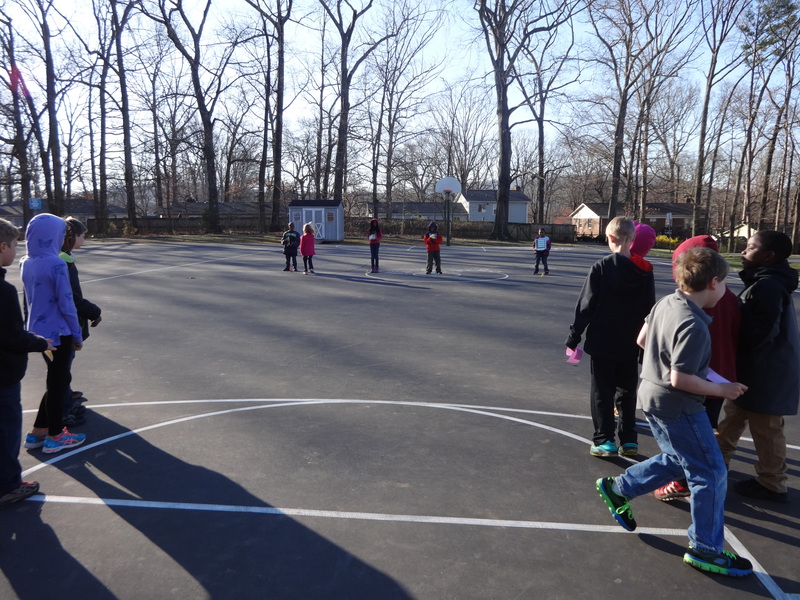 I see every single first, second, third, and fourth grade class on Thursdays for checkout – it’s a busy day, and one of my favorite days each week! Have you ever wondered what it looks like when 300 students return their library books on the same day? Every Thursday, I check in and shelve between 300 and 500 books, just for them to go back out before the end of the day. It’s an exhausting and rewarding process! 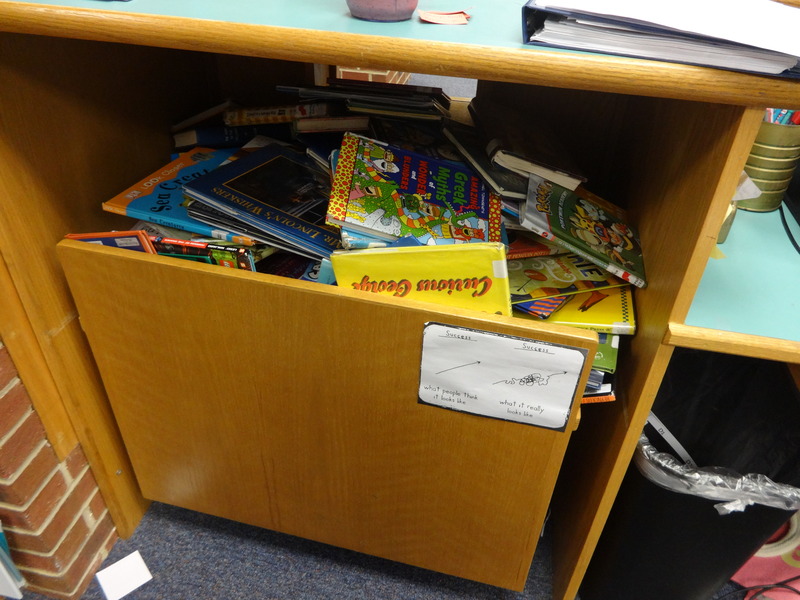 Above is a snapshot of what my book return cart looked like at about 8:20 this morning. Off to do some more shelving! Enjoy the sunshine! Winter Book Fair has arrived! Winter Book Fair preview day is here! All day, students of all ages have been filtering in and out of the library to preview all of the great titles that will be available for purchase next week. The Johnson Winter Book Fair will be open for shopping beginning Monday, December 8. Book Fair hours each day will be 7:40AM-3:00PM. Parents and guardians are welcome to shop with students during their scheduled library time, before school, or after school. Adults may pay with credit cards, cash, or check (made out to Johnson Elementary School). Students may pay with cash or check. Don’t forget about our Holiday Fun Raffle! This basket full of books, toys, and other cool stuff will be raffled off at the end of the Book Fair. Tickets are $3 each or two for $5, and every dollar earned goes towards funding Book Fair Scholarships for deserving Johnson Elementary students. 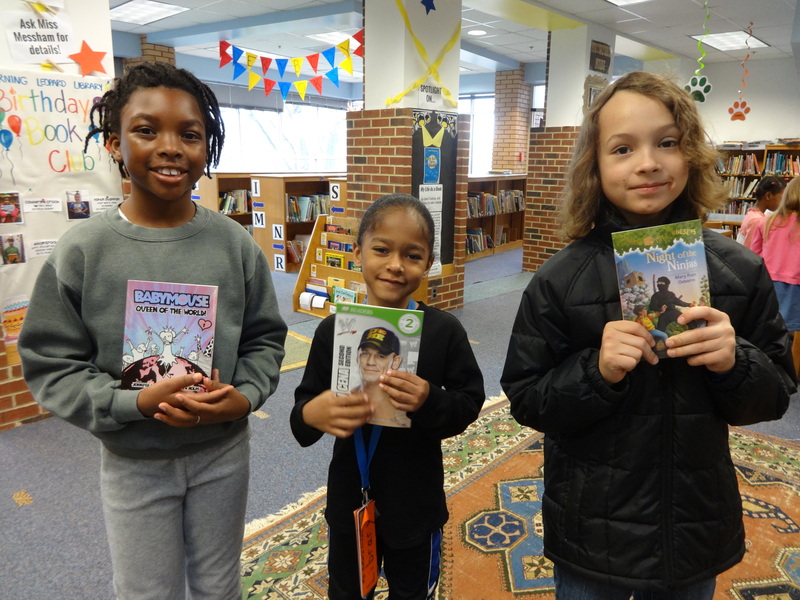 To learn more about our Book Fair Scholarship program, check out last year’s Book Fair Scholarship Essay post, or send me an email at messhas1@charlottesvilleschools.org. Congratulations to the winner of our Ultimate Summer Reading Kit – Lucy, a fourth grade student! I hope that you love your prize! This kit included more than 20 books, games, and toys, guaranteed to keep students happy and entertained over the summer! 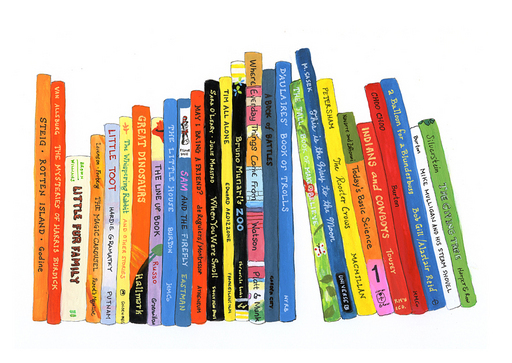 Popular fiction titles like Diary of a Wimpy Kid: Hard Luck and The Land of Stories were included, as well as some great non-fiction titles and even some well-known picture books like Pete the Cat and his Four Groovy Buttons and Substitute Creature. This seriously drool-worthy basket got a big reaction from kids – and from their parents! 100% of proceeds from ticket sales were used to fund Bookfair Scholarships for Johnson Elementary School students. To find out more about Book Fair Scholarships and read some of the amazing application essays written by Johnson students, check back this afternoon. Thanks to our incredible raffle ticket sales, we raised enough to fund SIXTY book fair scholarships for Johnson Elementary School Students! This means that every student completing a scholarship essay will have the opportunity to shop for a book using a Book Fair Scholarship. This would not have been possible without the support and generosity of the Johnson Community. 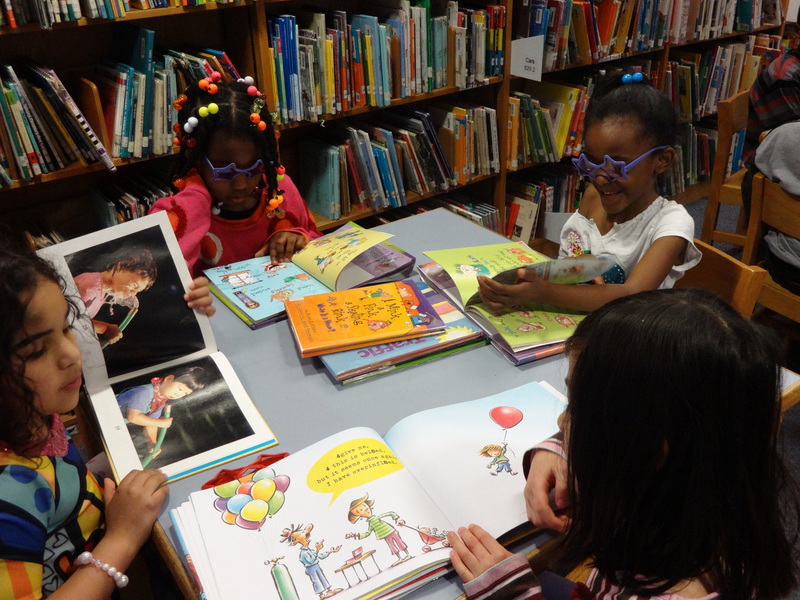 Thank you, thank you, thank you – it is because of YOU that some of our hardest working students will have books to read and enjoy over the summer! Bravo! Thank you to Scholastic and to Johnson Library Donors for donating the materials to make our Fiesta Raffle possible. Thank you to Johnson staff for volunteering your time and effort to make this Book Fair a success. And thank you to the Johnson Community for supporting the library! It’s that time again… a new Tech Talk is up and ready for action in the Learning Leopard Library. This time around, our Tech Talk features one of the electronic devices that our students can’t seem to get enough of…iPods! Have you ever wondered when the iPod was invented? Who makes iPods? How many different kinds of iPods there are? Or how many iPods have been been sold? If so, this is the display for you. An iPod timeline gives a visual history of the evolution of the iPod, from the first generation device in 2001 to the iPod touch, which was originally released in 2007. Using the photos provided by Apple.com, students can follow the incredible progression that Apple has made in iPod hardware over the years. Underneath the timeline, students can find an iPod F.A.Q., which features some of the iPod questions that I am asked on a daily basis. Have any other iPod questions? Come to visit me at the circulation desk and we’ll find the answer together! If you’re more of a hands-on learner, then the interactive piece of this Tech Talk is sure to capture your attention. To the left of the informational display, three iPods have been set-up in durable, safe mounts so that students can play and explore. The iPods are loaded with all kinds of educational apps, games, and puzzles, as well as videos and songs. Students are welcome to jump in hands first and explore all of the fun! Feel free to drop by the Johnson Library at any time to check out our newest Tech Talk, All About iPods. Learn some facts, ask some questions, and get ready to do some hands-on exploring! Friday Photo: What Does Your Library Do For You? Sure, our library is great. It’s colorful, it’s exciting, and the students love to visit. 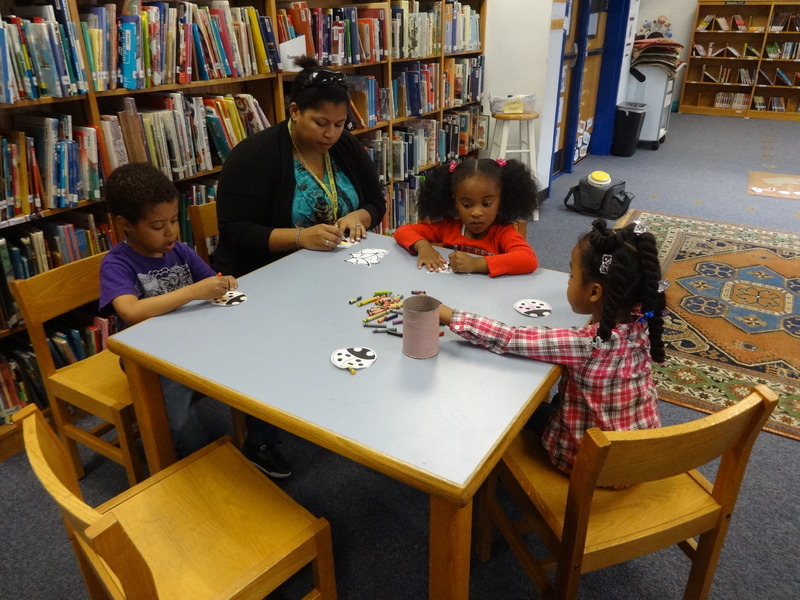 But what, exactly, does the Johnson Elementary School Library do for the students, the school, and the community? This colorful infographic summarizes four of the main instructional cornerstones of the Johnson Library: circulation, curriculum support, technology, and information literacy. Check it out to learn more about what the Johnson Library brings to our students every day. The time has arrived…. our Winter Book Fair is finally here! Seen in the photo from behind our “Special Event Sparkle Curtain” (the best way to keep a little bit of mystery), the Scholastic Book Fair has taken over the Johnson Learning Leopard Library. The excitement in the halls is palpable, and the students are unbelivably eager to see all of the educational and fun books that Scholastic has sent our way. 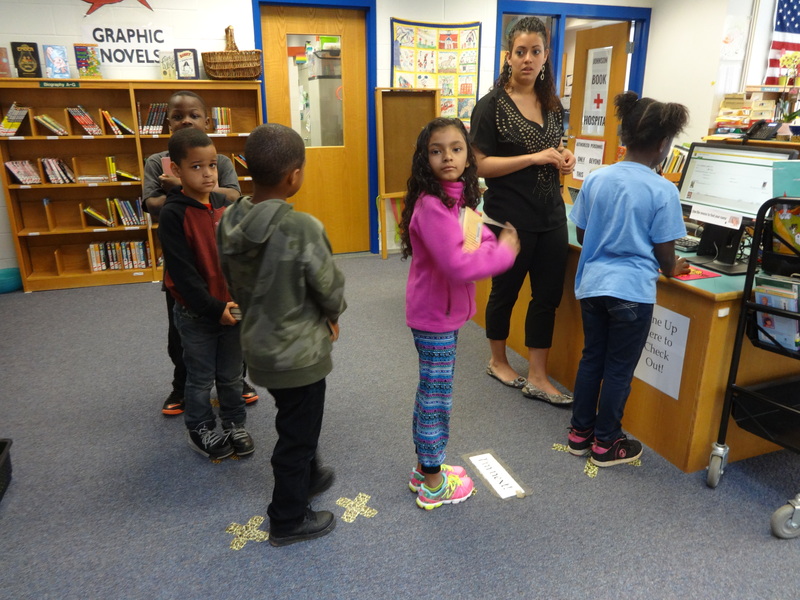 Students will be shopping at the Book Fair during their scheduled library time. Parents are welcome to join their students in shopping during this time. 2nd, 3rd, and 4th grade students can also visit the Book Fair in the morning during our regular open checkout time (8:00-8:45). The Book Fair will be open the evening of Thursday, December 12 before and after the Johnson PTO meeting, as well as the evening of Tuesday, December 17 before and after the Winter Chorus Concert. This is a perfect time to stop by with your family and get all of your holiday book shopping finished! 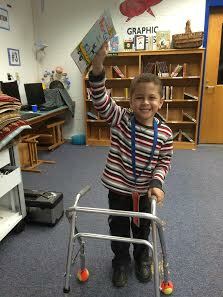 Look for Book Fair Volunteers for help with answering questions, calculating totals, and asking any other Book Fair related questions. And of course, look for me to say hello! Are you looking for the perfect holiday present for your favorite teacher? Skip the mug or the scented soap, and instead go for a book to add to their classroom collection. Books make wonderful holiday gifts, and we’ve done the hardest part for you – figuring out which book your teacher would like! Keep an eye out for the Johnson Library WishList tree, which is near the library door, close to the register. Each homeroom teacher has an “ornament” hanging on the tree, and inside each envelope is a WishList filled out to specify which titles they would like the most for their classroom. WishLists include all of the details that you need to find exactly what your teacher wants for the holidays this year. Deliver it immediately, take it home and wrap it, drop it off to Santa to deliver… however your teacher receives it, they’re sure to be delighted! Remember, all purchases made at the Scholastic Book Fair bring funds into the Johnson Elementary School Library. 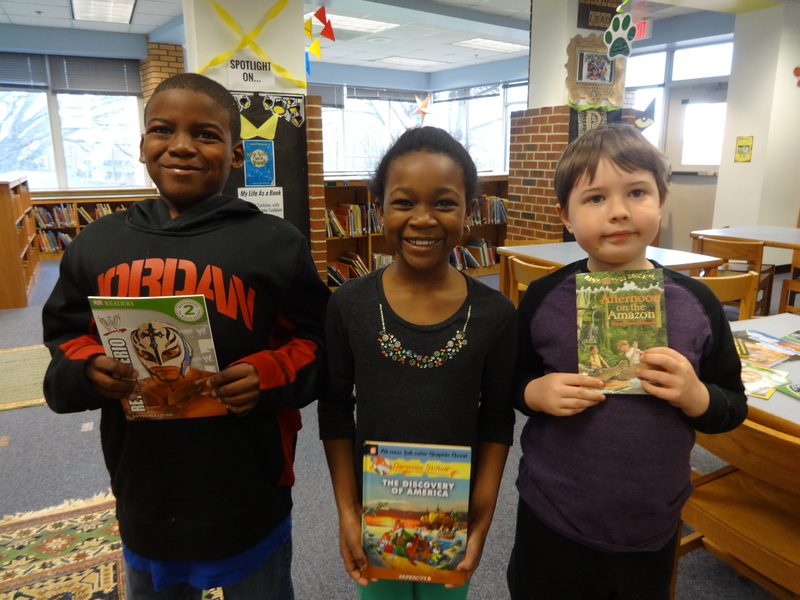 Proceeds from Book Fair sales help to purchase new materials for the school library. The Scholastic Book Fair is our library’s only fundraiser – so if you’ve had your eye on a book, this is a perfect time to buy it! Curious about what’s behind that sparkling curtain? Stop by the Johnson Elementary School Winter Book Fair between December 9-17 for perfect fun and educational holiday gifts for the whole family. I hope to see you there! 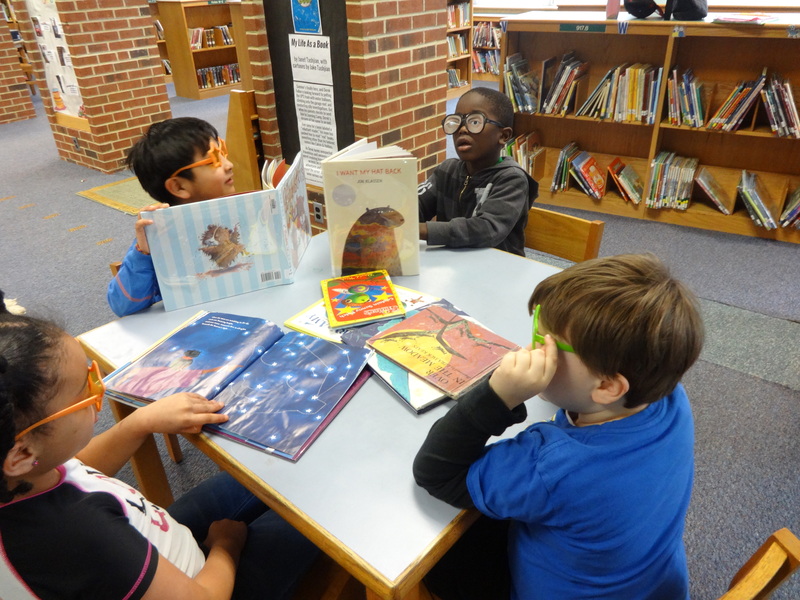 We have an extraordinary number of incredible readers here at Johnson Elementary School. I knew that we needed to find a way to celebrate the amazing number of books that these students check out and read every single day in the Learning Leopard Library. This sign, which is located between the library and the alcove near the front office, announces to the world how many books we have read as a team this year! On our fifth week of school, we have already checked out 2,694 books! WOW! Just this Tuesday, the number was almost 300 books lower. This number will be updated every week to reflect the hard work and amazing reading habits of our students. Keep it up, Learning Leopards! We are so proud of you! This week’s Friday Photo highlights some of the most popular additions to our shelves – high interest shelf markers! These shelf markers, which are attached to the shelves in places that mark some of our library’s most popular topics, help students to navigate the library independently. 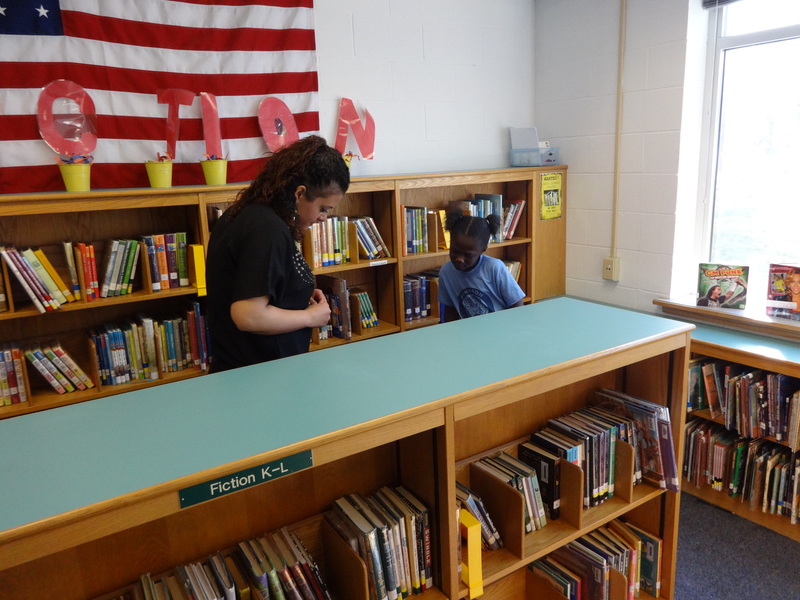 It has also inspired many students to step forward as Library Leaders and help each other to find books that fit their interests! Topics like mummies, football, mythology, baseball, fairy tales, drawing, and dinosaurs are some of the many marked in nonfiction. Fiction’s shelf markers focus more on popular series and authors, like the Magic Tree House books, the Harry Potter series, and Rick Riordan’s many titles (always a favorite! ).